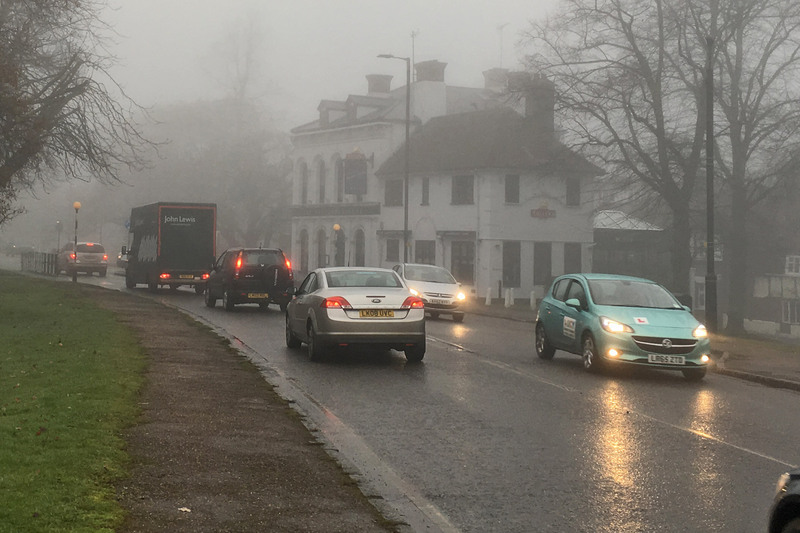 With freezing fog sweeping across the UK, now is a good time to get a clear understanding of how to be seen when visibility is at a premium. It should go without saying, but when it’s foggy, put your headlights on. Automatic headlights don’t always detect fog in the same way as they do darkness, so make sure your headlights are switched on manually. Now, you might ask if you need to use your fog lights. The answer, probably, is no – at least not straight away. Fog lights are there to be used proactively. You shouldn’t switch them on at the start of your journey and leave them on ‘just in case’ it gets a bit foggy. So when should I switch my fog lights on? If there are other cars around, use them as an indication of how poor visibility is. Can you see a car 100 metres (that’s roughly the length of a football pitch) in front, or coming towards you, without fog lights on? If the answer is yes, and fairly clearly, you don’t need to use your fog lights. If you find that you are struggling to see other traffic – particularly if you’re travelling on the motorway – then put your fog lights on. A good sign that you need to use your fog lights is that the fog is thick enough to cause you to slow down. As soon as visibility clears, turn your fog lights off. If you’re travelling in traffic and there’s a car behind you who will be able to see you without your rear fog light on, turn it off. What happens if I use my fog lights when I don’t need to? Fog lights can dazzle other road users, while rear fog lights can obscure your brake lights. Driving with them on can actually be more dangerous than not using them at all, which is why it’s important to think carefully about whether they’re needed. If a police officer sees you driving with your fog lights on when they’re not needed, you could be hit with a £50 fixed penalty notice at the side of the road. How do I turn my fog lights on? By law, all cars built since 1986 must have at least one rear fog light. This will be operated using a switch with a symbol similar to those above. 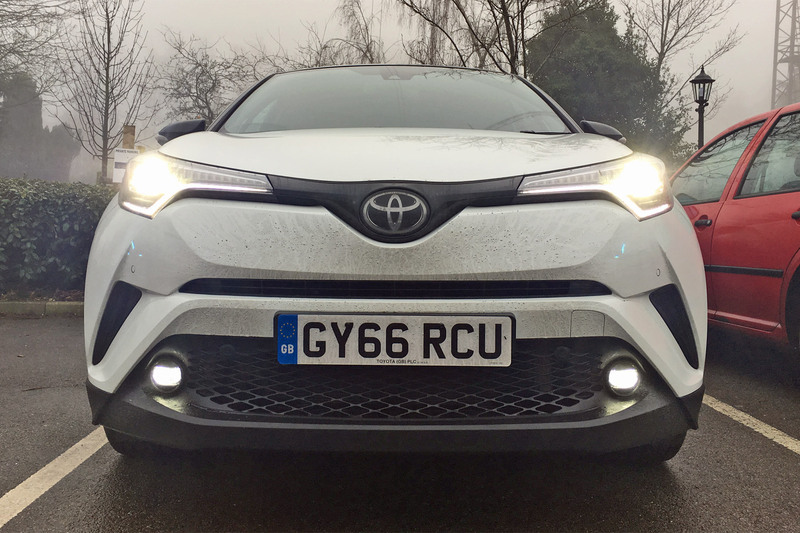 Front fog lights aren’t a legal requirement, but many cars have them fitted as standard. In most cars, they can be switched on using the same stalk as the headlights, or by a button on the dashboard. When on, you’ll see a warning symbol on your dash that looks like the above picture. 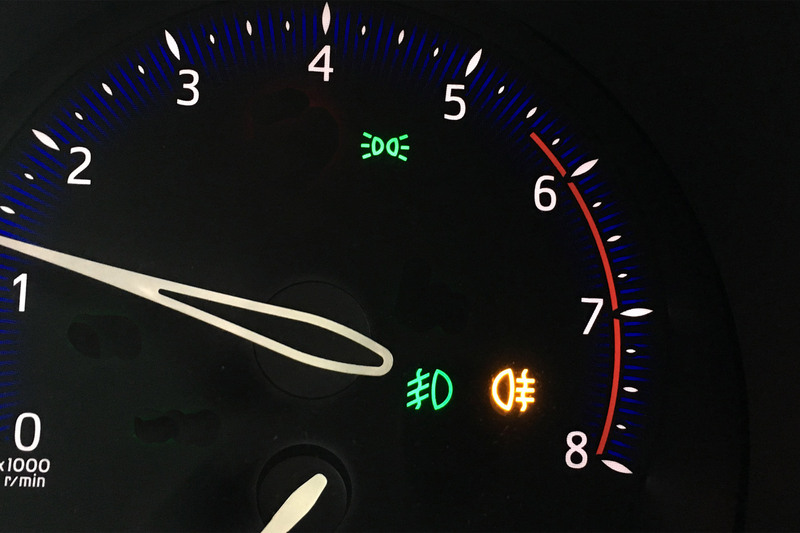 The one on the left indicates the car’s front fog lights are on, while the one on the right is informing you the rear fogs are lit. Any other tips for driving in fog? First of all, it’s usually beneficial not to use your main beam. While it might be tempting to flick it on to give a better view, in thick fog it’ll reflect and reduce visibility even more. Drive slowly, and leave a bigger gap to other vehicles in case they have to stop suddenly for something you can’t see. When you’re stopped, for example at traffic lights, keep your foot on the brake pedal so your brake lights are lit up, making you more visible to other traffic. When a car stops behind you, use your handbrake and remove your foot from the brake pedal to avoid dazzling the driver.